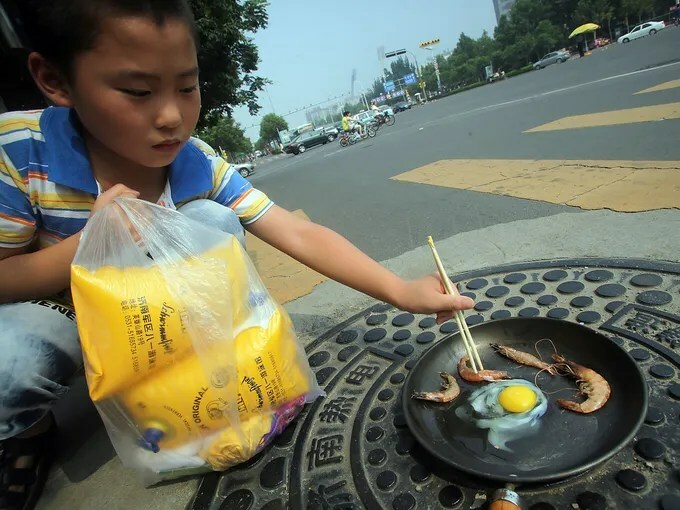 SHANGHAI (AP) – It’s been so hot in China that folks are grilling shrimp on manhole covers, eggs are hatching without incubators and a highway billboard has mysteriously caught fire by itself. The heat wave — the worst in at least 140 years in some parts — has left dozens of people dead and pushed thermometers above 104 degrees F in at least 40 cities and counties, mostly in the south and east. Authorities for the first time have declared the heat a “level 2” weather emergency — a label normally invoked for typhoons and flooding. “I’m so worried that the phone will explode while I’m using it,” he said. Extreme heat began hitting Shanghai and several eastern and southern provinces in early July and is expected to grip much of China through mid-August. Shanghai set its record high temperature of 105 degrees F on July 26, and Thursday’s heat marked the city’s 28th day above 35 C. At least 10 people died of heat stroke in the city over the past month, including a 64-year-old Taiwanese sailor, the official Xinhua News Agency said.